BodyScience shorts come aimed at the ultimate mobility. The shorts incorporate some of the latest technologies and come with a combination of great material choice and performance-oriented design. Most shorts are made from high-quality compression materials. The Australian manufacturer thus offers a good choice to battle muscle fatigue. The shorts work by compressing some of the larger and most important muscles in the leg. The activated muscles include the hamstrings, which plays a vital role in the flexion of the knee and is activated not only during running but even during functional exercises. There is also an increased attention to the quadriceps. One of the largest muscles in the body, the quadriceps is made from four smaller muscles which determine the movement of the foot. Being a large muscle which performs a demanding task, there is often the need to protect it, especially with common knee injuries. The construction of the shorts is also made for comfort with seamless hemming. The materials allow for the body heat to disperse making you cooler for longer. This feature will add value to longer training sessions or intense runs. One of the most advanced compression pants you can find in 2017 come with some innovative technologies. Made from Bioceramic fabrics, the pants are one of the best choices for advanced and professional athletes. They can also work for fitness enthusiasts which want one of the most up to date experiences available. Ceramics have been used for a long time as materials which can dispense heat. The Bioceramic fabrics use the same principle and help warm the legs. The material is quick-drying and dispenses heat and sweat. But its main strength lies in the capacity to use the natural heat of the body to help the muscles and increase blood flow. The increased blood flow can then speed-up some healing mechanisms in the muscles, especially the feeling of fatigue. But the proper use of heat can also have a positive effect on certain conditions such as Arthritis or some minor joint inflammations. This is all possible due to the futuristic material. This material is made using multiple types of ceramics which are collected in a powdered form and then fused together with Polypropylene fibers. Because this material is still under research and comes with a special manufacturing process it also needs special care and maintenance. This is why the pants are recommended for professionals because they are not to be washed as regular clothes. For example, you can only wash the pants in cold water and air-dry them. You can also limit the detergent to liquid form only. If you have the patience to properly clean and dry the pants you will have one of the most advanced training clothing on the market and probably the best compression pants for CrossFit. 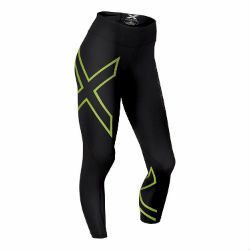 2XU compression tights are among the top choices for comfortable compression pants. They come in two color options and they are designed for function but also esthetics. They are made with a combination of materials which include 80% Nylon and 20% Elastane. Similar combinations have been used for professional athletes` kits. They are good for breathability, quick-drying and comfort. The pressure applied by the pants is constant and is focused on all muscles. You will get the full benefit of using the compression pants with reduced fatigue in the quads, hamstrings, calves, glutes and even in the abductors. This means you will have full freedom of movement without having to worry about pressure plates or pressure zones and you`ll thus be able to focus on exercising. The pants are made using medical circular knit, which is a major plus in the fight against muscle fatigue. It is also a good material which reduces vibrations and muscle oscillation which have been associated by multiple studies with the feeling of soreness and increased sensitivity and loss of comfort. Regular runners or advanced athletes will be glad to know this material is also antibacterial. So if you`re using it constantly you can rest assured there will be limited bacteria development on the pants themselves. Because the pants are so versatile, they can be used in multiple sports which include running and fitness. The antimicrobial proprieties also recommend the pants for hiking activities or for winter sports. The PWX Flex technology which comes to serve for increased flexibility can recommend the pants or water sports. Women looking for versatile compression pants can see the Active Research pants among the top choices. The pants can work for multiple sports. You can use the pants for your regular jogging routine and you can take them with you to your weekend yoga class. You can also use the pants in a gym environment which will have you performing multiple exercises in a single workout. The pants are versatile enough but also have the right properties which ensures you`ll be comfortable and bacteria free on the long-term. The materials used by the manufacturer are among the best on the market. This is why the pants are a good solution against moist, odor or bacteria. They will thus work great for longer gym sessions or running routines. The material will also ensure there is a good balance between the retention of body heat and breathability. With a minimalistic design, the pants will look great with any sporting outfit. But the compression pants not only look great but they will help improve some irritating conditions like muscle soreness through better blood flow and cell oxygenation. The pants can also help keep mild inflammation away, leading to better overall levels of mobility and improved biomechanics. With so many conditions like arthritis, tendinitis and shin splints, you can use compression pants to improve the overall tone of the leg muscles and help stay injury-free for longer. The pants are a good option for women looking for CrossFit compression tights to practice multiple sports without having to purchase multiple compression tights. They are so versatile that they can be used during workouts or even after exercising which can help to improve the recovery time. Using the pants after workouts can also be a good learning experience as you have the chance to get accustomed to compression clothing. The manufacturer sees the pants as a good choice for body firming which is great for women looking to lose or maintain weight. General toning is easier to maintain once you get to your desired fitness level and the pants might be a good tool to help you achieve this goal. With graduate compression, the pants are great for quicker warm-ups. This is essential even if you prefer to do a stretching workout as warmer muscles can mean you have a reduced risk of muscle or joint injury. Then women get the benefit of reduced muscle oscillation and reduced soreness. This can be frustrating especially with HIIT workouts or running sessions. Muscle oscillation has been associated with increased fatigue and this is why high-impact exercises like circuit-style training can lead to soreness in a short period of time. Lululemon Sculpt Short is one of the best lightweight designs on the market. It offers a comfortable option for women looking for a lightweight workout. The product is smartly designed, especially in the key areas. For example, the waistband is larger and doesn`t put too much pressure on the body. This target area is one of the most important areas both in terms of comfort and in terms of heat. Its design will also benefit women who are looking to reduce sweat levels. The pants are manufactured with a seamless design. This allows for reduced fabric use which won`t find any bulk materials chuffing. It can be said that the pants are a cross between shorts and yoga pants, bringing you the best of both worlds. You get maximum versatility with the comfort of yoga pants and the improved ventilation of regular shorts. Since you will be getting a special fabric you need to follow some basic rules to keep the shorts in good condition for longer. You need to set your washing machine to a maximum of 30 degrees and turn the tumble drying option on low. The pants are not meant for dry-cleaning and they should be kept away from ironing to keep their quality. 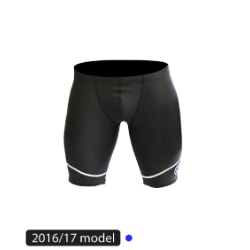 The half-quad shorts are a good option for men looking for compression clothing which comes with all of the benefits of lower legs ventilation. The shorts use a combination of technology which makes them unique. They use the BodyScience`s targeted and graded compression to get the most benefits to functional anatomy. The shorts come with targeted compression and groin support, being one of the most specific shorts on the market. They will work for advanced users in need of a custom solution. The pants use a thin, 2mm, neoprene fabric which acts to improve the stability of the core together with the targeted area of lumbo-pelvic-hips. One of the huge benefits of the pants comes with the combined technologies mentioned above which work to improve joint biomechanics. The pants can also help maintain a good posture and stability in the lower and upper legs. Advanced athletes will be glad to know that the shorts can absorb some impacts and distribute the shocks to a wider surface reducing muscle oscillation and soreness. And finally, the shorts can improve recovery time. All athletes know the importance of proper recovery and how the resting period is different from person to person. Make sure you don`t postpone your scheduled workouts and limit the impact of muscle soreness by recovering faster and smarter. A dedicated compression solution for dedicated athletes, Virus` Au11-Bioceramic Compression V2 represents one of the most advanced solutions on the market. The shorts use a lightweight fabric which is good for keeping moisture away. One of the biggest problems of professional athletes is moist and its impact on the skin. It is uncomfortable and it can also help the developing of bacteria. Keeping yourself as dry as possible should be among the top priorities, especially with compression clothing as your body may tend to get overheated with lower-quality products. The shorts keep you cooler which in turn means you`ll sweat less. This makes the shorts a good option for multiple sports and even as an addition to winter sports clothing. Sweating on cold temperatures for long periods of times is a one-way ticket to a cold, so you need to ensure you stay as dry as possible. The shorts are focused on improving circulation and you get one of the most up to date technologies you can find in terms of blood flow. The main focus of compression clothing is to improve circulation and especially in key target areas of the body. This will ensure you will maintain good mobility and good oxygenation in the muscles and tendons. To achieve this, the manufacturer has used some compounds like zirconium, aluminum or titanium. The compression shorts use the authentic 2XU combination of materials which include 80% Nylon and 20% Elastane which give men the much-needed flexibility and comfort. With medical circular 70 Denier knit, the shorts offer consistent and powerful pressure. The pressure is constant and coming from all angles, it targets the bigger muscles groups like quads and hamstrings. The constant pressure means you`ll get better cell oxygenation and reduce the impact of muscle soreness with intense, regular workouts. Since the pressure is constant yet powerful, you will also get improve muscle alignment. Correct muscle alignment has been linked with increased power even over longer periods of time like with rowers. The materials are made with antimicrobial proprieties. This will help you stay healthier and more comfortable with a varied number of sports which can include: cycling, fitness, climbing and even water sports. In the end, the shorts can be used for recovery. There is an increasing concern among athletes for recovery time and wearing the shorts even after exercising can have a positive effect on diminishing recovery time. Nike has designed the Women’s Pro Cool 3-Inch training shorts with some of the simplest yet effective technologies. The short uses the Dri-FIT fabric technology which keeps you dryer for longer. The technology can also be a good tool to improve the comfort level necessary in many sporting activities. The waistband is stretchable and can help you define a slimmer look. The stretchy design is comfortable and not only does it improve the overall feeling of the shorts but it can also look distinct, as Nike has made several colors options available to the waist band. In terms of performance the shorts benefit from the lined inseam which helps with the natural range of motion. This is not only important for comfort levels but it also says a lot about the product, as many compression shorts seem to prevent the natural range of motion. The shorts use a specific combination of materials which is based on 80% Polyester. Nike has also added 20% Spandex for the ultimate stretchiness. The good news is that you can safely wash these materials in your washing machine. Compression clothing has been used to reduce recovery time. This is achieved through a combination of technologies which involve compression with various fabrics. Aside from the benefits mentioned above, compression the best compression shorts for CrossFit can also help prevent varicose veins or swollen legs. There are plenty of reasons to start using compression pants, but how do you know what to look for? The fabric or mixes of fabrics are important as they will set the tone of how the pants will perform and on how you will feel while wearing them. Regardless if you prefer shorts or pants, you need to ensure the fabrics are of high quality. Some certain types of fabrics need special care. In case you need the latest technologies you will need to learn how to properly wash the pants. Most pants can`t be washed with temperatures higher than 30 degrees Celsius, some even lower than that. For example, the ceramic technologies in the VIRUS Au9-Bioceramic require a more delicate care. Premium materials should also be kept away from ironing. The fabrics can be negatively impacted by the hot iron so make sure you read the full instructions before using the compression pants. Some bigger manufacturers have started using combinations of materials like Nylon, Elastane or Polyester and they all have specific requirements. Usually, the manufacturer will recommend the guidelines to follow according to the most demanding material in the pants. Some premium pants don`t require any replacements for years. So if you plan to stick to your fitness or running routine it might be worth investing a bit more upfront on quality compression clothing and saving down the years. 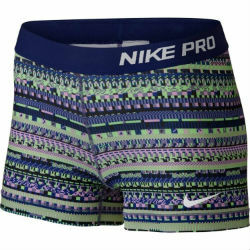 In terms of long-term use, Nike`s Pro Cool 3-Inch training shorts are among the best CrossFit pants as they come with a combination of materials which includes Spandex, something we don`t see with most compression clothing in its range. Some compression pants use compression panels or points to target specific areas. In theory, this is a good option for everybody as you can just choose your favorite area to work on. In practice, unless you are a professional athlete, you might not need to work in such detail. General gradual compression is enough for most users. This doesn`t mean you should not consider targeted compression but it just goes to show that you the difference is negligible and you can save some money by choosing otherwise. If you are an advanced athlete or fitness enthusiast and want to experiment you can choose multiple options and test to see which one works for yourself. But for most users, general compression is enough for the larger leg muscles. The design of crossfit compression pants or shorts might not be among the top features you look for in compression clothing. But the design is quite important as it can set the difference in terms of looks and most importantly, pricing. Since some designs are more expensive to manufacture, it will lead to higher final price. If you’re not into the latest designs you might save some money. But also if you use the clothing in a setting which is not visible, such as with winter clothing, it might not be worth to spend the time to look for the best design but rather for the best performer. If you are going to use the compression clothing in an open environment or in the gym it might be worth finding something which will fit your own personal style. In the end, the comfort of the clothing is also given by the design, not only by the fabric and feel. In this video, we discover what goes behind compression clothing. We need to understand how compression pants can improve body coordination, reduce fatigue and come with a better fit over regular clothing. As we noted before, this technology can also increase muscle power with better compression coordination. The comfort of compression clothing has been long debated. Some people don`t like the feel of constant compression against the muscles and would never wear specific clothing. Others feel they can only perform with good compression gear. The truth is most people are in between these two categories. Most people feel good and perform well in quality products. Premium compression pants can help with muscle alignment. This means you`ll be able to perform your routines with more strength and natural movements. Comfort is also influenced by characteristics such as ventilation and moist. 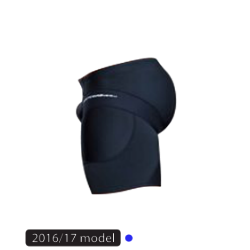 Good compression short need to keep moist and sweat away from the body as much as possible as you will tend to get hotter with increased blood flow and oxygenation. Some top products come with materials which are antimicrobial. This is essential for all users, but specifically to the advanced user. The advanced user or the professional knows the importance of perfectly clean and safe equipment and the feeling of having it available on the long term. It helps prevent things like mild discomfort and even some skin conditions. If you have sensitive skin and always look for skin-friendly clothing, you might want to look for compression pants which come with antimicrobial properties. It’s also worth noting that the more technologies the clothing has the more complex the maintaining will be. So if you`re looking to get as many technologies as possible with your product, antibacterial include, you might want to spend some time to read the full instructions on how to properly maintain the clothing. This might start with lowering the washing temperature and it may even require you to fully change so liquid soap or washing detergents. But it the end, there is no performance without some effort. The final decision will be probably made by pricing. 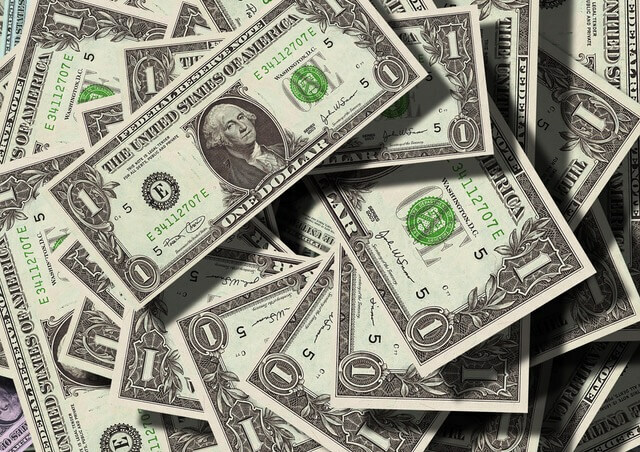 As you know, to everything which is most expensive is right for you, but at the same time, you might need to pay more the get the best product. Some products are more expensive only by name, as they might be made by a renowned manufacturer. Other clothing might be more expensive to make, like the Bioceramic materials. So how do you choose and set the right budget? The simple answer is just to consider your own needs. Do you really need the most advanced compression technologies? Will you be let down by the cheapest product? These questions need to be asked before purchasing your preferred product. In the end, it may also be worth noting that most users are somewhere in the middle, finding the right balance between performance and return of investment. Make sure you spend some time to analyze what the competition offers in the similar price range and once you have 2-3 products in mind you can decide on which one is better fitted to your own goals. Pricing is, most times, an indicator of the quality, fabrics and research cost behind a product. You may notice that the most up to date compression pants are also the most expensive but at the same time that is what is needed for cutting-edge athletes to get to the next level. Make sure you want a product which is not only right for you but which will push you to improve your fitness goals.